Ensuring that your dog's nutritional needs are met can be a difficult task due to the confusing nature of pet food labels. But using all the information available it is possible to ensure that your furry friend is getting the food that he needs. If you have a dog, you don’t need me to tell you how important food is to their happiness. But even if you realize how much your dog loves food (the speed with which they gobble it up is a good clue) you may not realize how complex dog foods can be. More than 36% of households in the U.S. have a dog, and all of these dogs need to eat. The pet food industry in America is worth more than 30 billion dollars, but how can we tell what’s best to feed our furry friends when every package shouts that their brand is the best? Let’s take a look at the science. Prior to 1860, dogs and cats were largely fed the leftovers of their human handlers. But in 1860, James Spratt brought the first commercial pet food to market in the form of a biscuit. At the time, little was known about the nutritional requirements of cats and dogs, so they were fed the same foods. Until the mid-1930s, pet food was not sold in the same places as groceries, due to fears that it would carry germs to nearby groceries. Nevertheless, Spratt's biscuits proved popular amongst pet owners due to their convenience and low cost. In 1908 Milk-Bone began producing their famous biscuits, and in 1922 the first canned dog food was marketed under the name “Ken-L-Ration”. Until the invention of the extrusion process, canned dog food comprised more than 90% of the dog food market (except the years during WWII when rationing of metal and meat forced manufacturers to make dry foods). Extrusion is the technique used to make the vast majority of dry commercial dog foods today. Ingredients are ground into powders and combined with water to form a paste, which is shaped into kibble pieces. These pieces are then cooked at high pressures (20-30 bars) and temperatures (100-150˚C). The first commercially available extruded dog food was Purina Dog Chow, which became the best-selling dog food in the U.S. within a year of its release. Extruded pet foods are still the most popular option amongst pet parents, in part due to their convenience, safety and low cost, and in part due to their benefits to dogs’ dental health (the mechanical abrasion from chewing hard pellets helps to clear dogs’ teeth of plaque and sediment). As we’ve learned more about how to best feed our furry friends, commercially available dog foods have become better tailored to canine needs in all stages of their life. Commercial dog foods are regulated by a few different bodies in the U.S. and Canada. The Association of American Feed Control Officials (AAFCO) is the primary organization in charge. They set the standards for what claims are evidence-based, and they publish regulations and nutritional profiles that manufacturers must heed. The National Research Council (NRC) is also involved in publishing nutritional recommendations, as is the Food and Drug Administration (FDA) which regulates the safety of ingredients and the veracity of claims made on packaging. The claims that do get made on pet food packages, however, can be really confusing, so let’s go over some basics. Just like you and I, pets need energy from their food in order to function. But unlike human food packages, which express energy in calories, pet foods express energy in terms of kcal of metabolizable energy per pound of food. Metabolizable energy is the energy contained in the food that is actually absorbed by your dog. It’s determined through feeding trials, in which animals are fed the diet and their urine and feces are collected and analyzed for their energy contents. 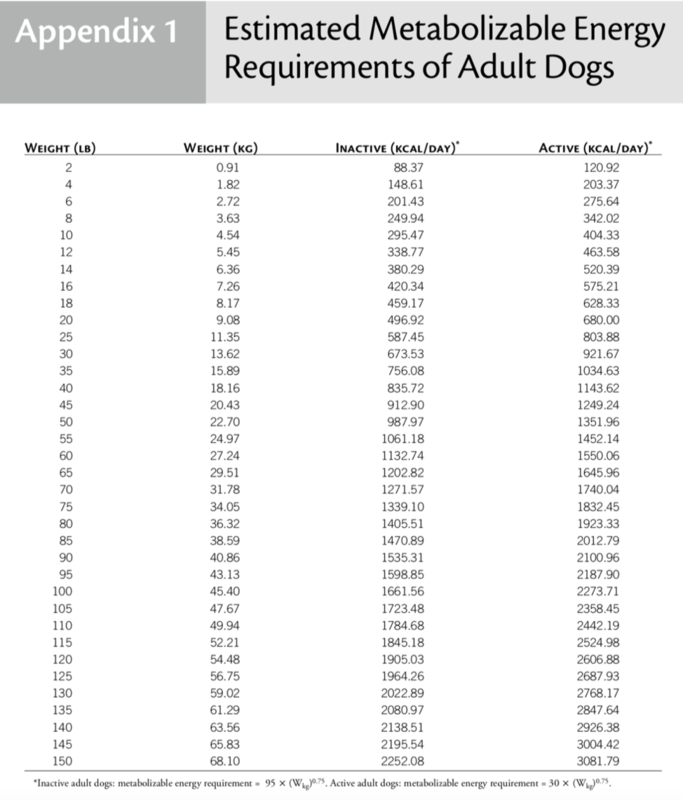 If displayed, the metabolizable energy is your first tool for evaluating a type of dog food. Sadly, not all pet foods include the metabolizable energy of the product on the package. Many instead choose to display the proximate or guaranteed analysis. These are similar to the nutrition facts displayed on human foods, but don’t actually provide as much information. The guaranteed or proximate analysis displays the percentage of the product, by mass, that is made of crude protein, fat, fibre and moisture. Other nutrients may appear, but only these four are mandatory. The moisture content of a particular macronutrient can give a food the appearance of having more or less than it truly does. An example is shown below comparing a wet and dry dog food. On first glance, the wet food appears to contain much more protein than the dry one, but when calories provided by protein is calculated instead of the mass provided by protein, they are almost identical. These analyses are your second tool for evaluating a kind of dog food, but neither it nor metabolizable energy alone gives you the whole picture. If you’re wondering what the difference between a proximate and guaranteed analysis is, the answer lies in the recipe for the pet food. Some foods are made with a “fixed formula”, which means that the ingredients of the food do not change between batches, while other foods (commonly lower budget ones) are “variable-formula” diets, meaning that the ingredients will change according to the market prices of available ingredients. The nutrition, however, will not change. If your dog is quite picky, choosing a fixed-formula diet can avoid any changes in the flavour of their food, but if, like most dogs, your pet is willing to eat anything they can get their mouth around, they are unlikely to notice the changes from batch to batch.. Your third tool for evaluating dog food is the Ingredient list. They can be useful for comparing the components of a food, but don’t actually tell you much about the amounts of certain ingredients in a food. This is, again, due to moisture in the ingredients. Like in human food, pet food ingredient lists put the most abundant ingredient by weight first, but just because an ingredient is the heaviest doesn’t mean it is contributing the most energy. Ingredient lists can be scanned for things your dog dislikes, or is allergic to, but do not tell you the main ingredient in a food. It’s also important to not panic when looking at ingredient lists. Many foods are supplemented with vitamins and minerals, but instead of recognizable names like “vitamin K” the scientific name of a compound (menadione sodium bisulfite complex) may appear. Ingredient names you can recognize may put your mind at ease, but supplementation with vitamins and minerals helps ensure that your pet is getting everything they need to thrive. These claims mean that the product has either been formulated to meet the AAFCO’s nutrient profiles for dogs or has been shown in a feeding trial to meet the nutritional needs of dogs. An alternative statement, “intended for intermittent or supplemental use”, is displayed when a food does not meet the complete nutritional requirements, and thus cannot alone sustain a dog in good health. If a food states that it is formulated to meet your dog’s nutritional needs, you can be confident that it will. Statements that certain ingredients can cure, treat, or prevent a certain medical condition are not permitted on dog food (this includes claims that a food is “hypoallergenic”), but nonspecific claims like “promotes healthy skin” are. Other statements that may be seen on dog food labels include the terms natural, organic or human grade. While natural does have an AAFCO-regulated definition (all ingredients must be derived solely from plant, animal or mined sources), organic and human grade do not. These are simply buzz words used for marketing purposes. The last tool you have for evaluating a brand of dog food is the feeding instructions. While a generic brand of dog food may seem cheaper, it’s possible that the ingredients used to make it are less digestible than those used to make more expensive foods. 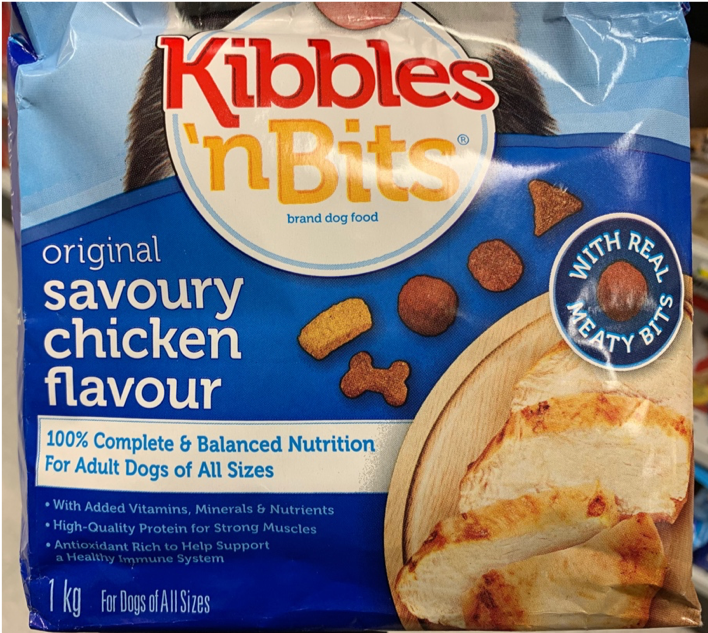 This will be reflected in the feeding instructions, as more of the cheaper food will need to be fed to your dog to meet their nutritional requirements. The cost may, in the end, be the same as if you fed your pet the lower quantity of the more expensive food. Pet food labels are confusing, especially when it has taken most of us most of our lives to become literate in human food labels, but with a little bit of investigating it is possible to ensure that your dog is being fed a healthy diet. If you ever need some help, talk to your veterinarian, they are after all the expert. Want to engage with this content? Comment on it here on our Facebook page!